Shops who had sat idly on the “on-ramp” of “Road to Gold” can no longer claim that status starting Jan. 1, 2019, I-CAR announced Wednesday. And shops which had accomplished Gold Class under the looser criteria of ProLevel 1 techs and a single employee satisfying all four major shop roles will receive a year to meet the tougher Gold Class rules announced Wednesday, the educational organization said. 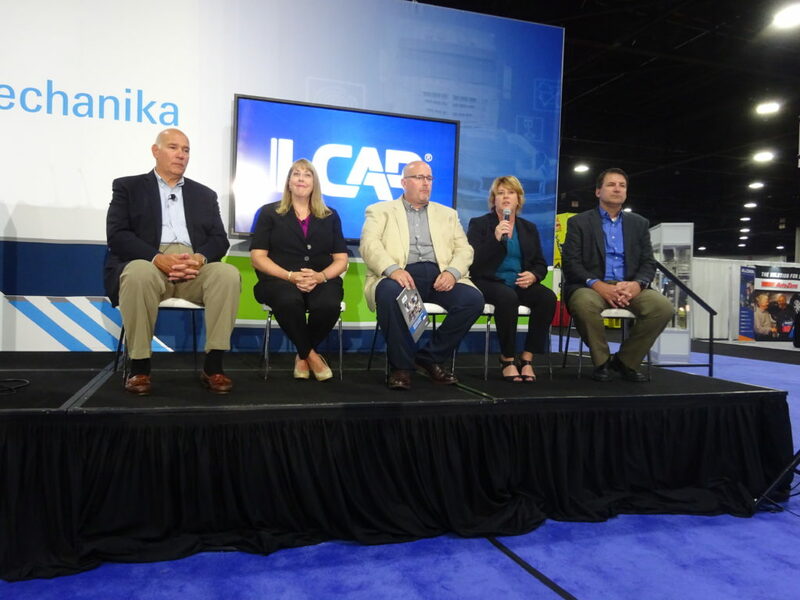 I-CAR explained the transition and why the “Road to Gold” concept would expire in a NACE event Wednesday promoting a sweeping overhaul of its curriculum and the Gold Class and Platinum criteria. CEO John Van Alstyne said the “Road to Gold” idea had taken on a “‘recognition level'” status, yet “it was never meant that way.” Some organizations were content to stay on that “on-ramp,” Van Alstyne said, and so I-CAR was eliminating that concept after Dec. 31, 2018. I-CAR sales and marketing Senior Vice President Nick Notte said Wednesday that many shops are Road to Gold and “very close,” and his counsel to them was, “‘Do what you can. '” It would be much simpler in 2019 for a shop made Gold Class under the old rules to meet the new Gold Class criteria than it would be for a shop which failed to achieve Gold Class by the end of 2018, he said. He suggested repairers examine which Alliance training their technicians had taken — some of it might count for I-CAR credit, but their technicians might not have applied for it. Another possibility involves having techs interviewed by I-CAR to gauge their existing skills; proficiency might translate into I-CAR ProLevel 1 credit under a new initiative. Van Alstyne said that going forward, all Gold Class shops must have at least 100 percent of structural technicians reaching ProLevel 2. Half of the employees within each of the three other key role categories (Estimator, Non-Structural Technician, Steel Structural Technician, Refinish Technician) at the shop must also reach ProLevel 2. He said the reason for the change — previously, a shop could make Gold Class with a staff at ProLevel 1 — involved the fact that the “minimally required skills courses” were housed in ProLevel 2. It was important for a technician to have the “fundamental knowledge” of ProLevel 1 and the “foundational skills” of ProLevel 2. No longer can a single person represent all four roles necessary for Gold Class either. I-CAR will only allow a maximum of two categories per person to count. 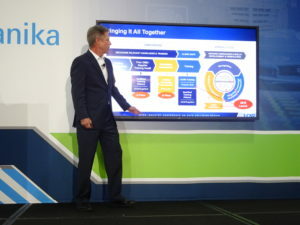 Allowing a single person to still put two technical roles towards the Gold Class Checklist was done for the benefit of smaller shops, which might have a single person functioning as a structural and non-structural tech, Van Alystne said. Gold Class shops that train every one of the necessary technicians to ProLevel 3 “will be recognized at a higher level of Gold Class recognition beginning in 2020,” I-CAR wrote. I-CAR will give existing Gold Class repairers a year to catch up. “During this time, shops must meet progress milestones that are outlined in a preassessment report, or they will lose their Gold Class status,” an I-CAR website discussing the transition states. 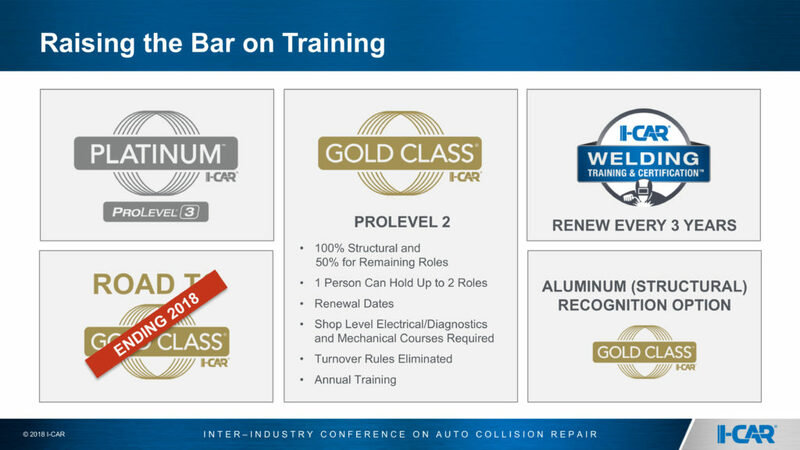 We asked why I-CAR had opted for a transition period rather than just making a hard deadline to retain Gold Class status at, say, halfway through 2019: Either you’ve met the new Gold Class criteria by then, or you’re no longer Gold Class at all. I-CAR strategic development Vice President Ann Gonzalez said shops had worked hard to reach Gold Class, and technician turnover had often led to staff being at different levels of accomplishment today. Gonzalez said I-CAR wanted to give those shops time, and it couldn’t evaluate all of them in January 2019. She said I-CAR would offer shops “some trust” that they would keep training and give them a prescription that needed to be followed within a year, calling it a “fair deal” to the shops that had made the effort to clinch Gold Class already. But why should a shop still full of ProLevel 1 techs in 2019 — which Van Alstyne suggested were inadequate to perform a proper repair — be allowed to claim Gold Class status like a shop which had met the stricter ProLevel 2 requirements? “We’re trying to work with the industry,” Gonzalez said. She said this acknowledged the hard work existing Gold Class shops had done and gave them a 12-month cycle to catch up. Technicians since 2010 have been designated Platinum at ProLevel 1. But under the overhaul announced Wednesday, an employee couldn’t call themselves Platinum unless they’d reached ProLevel 3. It made no sense to bestow I-CAR’s “highest credentialing” without requiring the technician to reach the highest level of training, Van Alstyne explained Wednesday. I-CAR said it will allow Platinum techs two years of that title before yanking the designation. “Current Platinum Level technicians will have up to two calendar years, from January 2019, depending on their current level of training to achieve the increased requirements, with progress milestone goals achieved throughout this period,” I-CAR wrote. 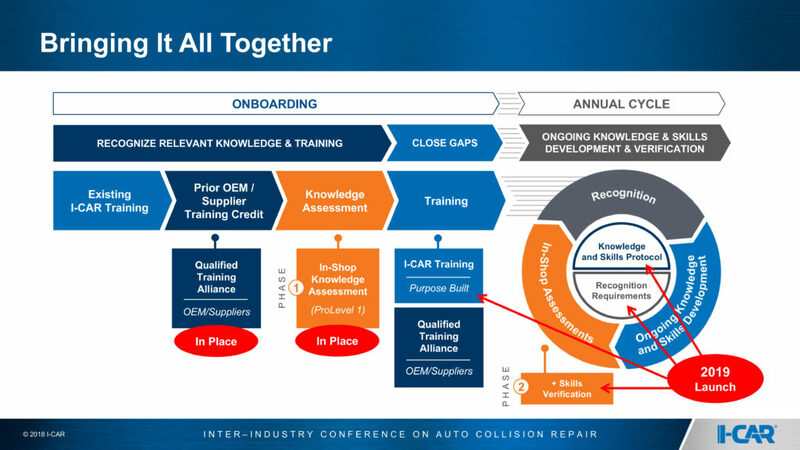 However, I-CAR organization plans to improve its process of allowing Alliance training (such as a paint manufacturer’s class) to count for I-CAR credit. I-CAR will also continue to grant waivers for ProLevel 1 training to technicians who demonstrate suitable knowledge in interviews. Van Alstyne on Wednesday presented a slide of “Strong Industry Support” from all three sectors carrying logos of all Big 4 consolidators and CARSTAR, all Top 5 U.S. automakers, and all Top 5 insurers except Progressive. He said he had discussed the changes with the brands featured on the slide, many of which had Gold Class built into their network programs.